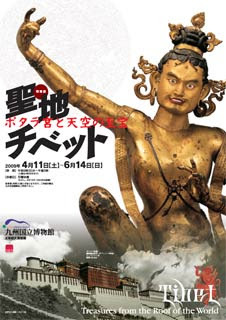 The Chinese government just a couple of weeks ago attempted to obstruct the auction in Paris of what it calls looted national art treasures, while here in Fukuoka we have the Japanese government, through it's national museum in Dazaifu, cooperating with the Chinese government in a month-long exhibit of Tibetan cultural relics. I don't think anyone asked the Dalai Lama if they could borrow a few statues and paintings from the Potala palace, but a few such items will be on display here in Japan. Just this week I met two well educated Japanese women who admitted they knew very little about the situation in Tibet, about the Dalai Lama, or about Tibetan Buddhism. And if that is true for them, how much more so for the general population. Most potential visitors to the exhibit are not likely to weigh the consequences of supporting this project through the purchase of tickets; even those of us acutely aware of the situation are subject to old habits, to reacting to pleasant forms and ideas. While buying train tickets this week, Mutsumi noticed the colorful image of Damarupa and added a set of exhibition tickets to her purchase. When she showed them to me that evening, I was pleasantly surprised to find such an exhibit opening so soon after arriving back in Fukuoka. My intention yesterday was to add a post here announcing the exhibit for the benefit of local readers, but as I began to do a little research at the museum's website I noticed that the pieces in this exhibit are administered by China's State Administration of Cultural Heritage and the China Cultural Heritage Exchange Center. The Chinese government has over the past decade begun to realize the benefit of preserving Tibetan culture as a valuable asset in attracting tourists and in burnishing a self-created image as a protector of the Tibetan people. This exhibit in Japan seems to be part of what the Chinese today might generously refer to as the government's marketing strategy; the Maoists would have had no shame in calling it propaganda. My purpose here is not to discourage people from attending this exhibit. Especially for those like my female friends, it might prove the beginning of a process resulting in clearer understanding. Perhaps an interest in the culture will lead them to learning about the strained conditions under which many Tibetans now live, and that may lead in turn to more informed decisions, increasing pressure on the Chinese government, and better living conditions for Tibetans. For ourselves, we already have tickets. I thought perhaps to sell them to someone else, but still the money has already been paid to the Japanese and Chinese governments. Perhaps we will go and in observing perhaps find some way to help visitors better appreciate what they are seeing. 2009 April 11 Sat. to June 14 Sun.